In case you haven't noticed, LUNAR: Silver Star Story Touch is out now in the iTunes store. It was released on September 20th, 2012 and is compatible with iPhone (3GS and later), iPod touch (2nd generation and later) and the iPad. 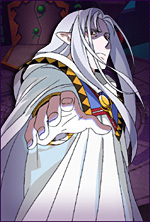 We've had a lot of discussion down in the Lunar Threads LUNAR: Silver Star Story Touch forum. Word is that there will be an update coming soon with various bug fixes, performance and user interface enhancements and more. Make sure to keep an eye out for that. You can get the game in the iTunes store.